Suitcase ramps are portable wheelchair ramps that are available in various lengths and fold in the center for easy transporting and storage. 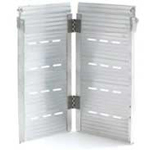 They are sometimes known as bi-fold ramps and usually have a suitcase style handle that allows them to be carried like a suitcase when folded. 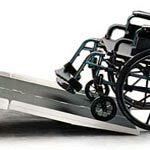 Suitcase ramps are one of the more popular styles of portable wheelchair ramps because they can be quickly and easily set up, removed and transported. 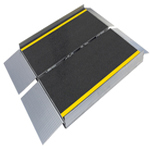 Additionally, because suitcase ramps provide a full width platform when set up, they are suitable for both wheelchairs and scooters whether three wheeled or four wheeled. 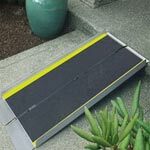 Suitcase ramps are normally made of aluminum to keep their weight as low as possible while still providing the strength needed to support the user and their equipment however, there is at least one manufacturer who makes their suitcase ramps out of fibreglass. 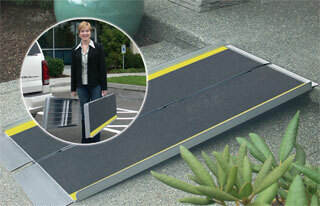 Depending on the manufacturer, the suitcase style ramps will weight capacities of 600 lbs. to 800 lbs. and lengths from 2' to 6' long. 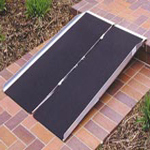 For applications where more than 6' of length is required, the most common option is to purchase a multi-fold wheelchair ramp. Weight: 11, 15, 21, 26 or 30 lbs. Weight: 16, 22, 28 or 34 lbs. Folded Size: 36" x 16" x 4"
Weight: 10, 15, 20, 24 or 28lbs. Weight: 12 to 42 lbs. Weight: 10, 15, 20, 25 or 30lbs.